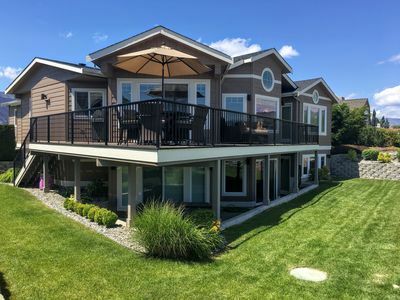 An exceptional choice for large groups, this four-bedroom Manson vacation home boasts a great location for lake adventures and exploring in town, plus great amenities like a private hot tub, a pool table, an outdoor deck, and a sprawling backyard for touch football with friends or family. 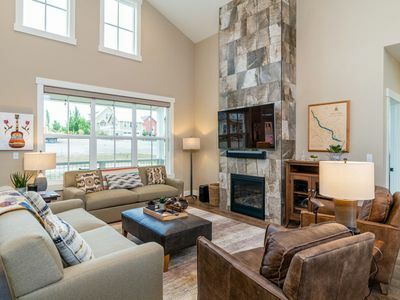 It welcomes up to 10 guests and features three separate living areas. 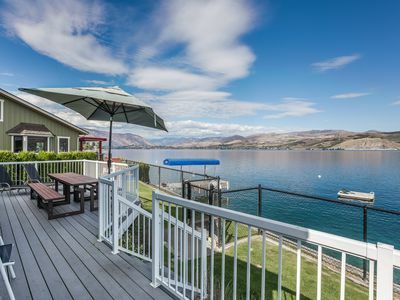 Perched on a hill overlooking Lake Chelan, this home's location is perfect for seasonal activities like skiing, stand-up paddleboarding, kayaking, and sailing. 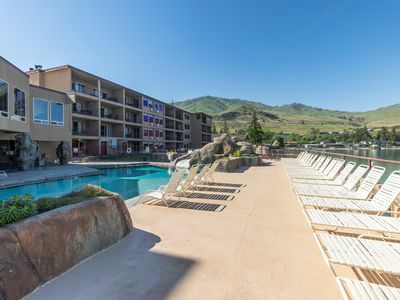 But it's also near Echo Valley Ski Area (nine-and-a-half miles northeast) for wintertime fun on the slopes and historic downtown Chelan (eight miles southeast) for shopping, dining, and entertainment throughout the year. 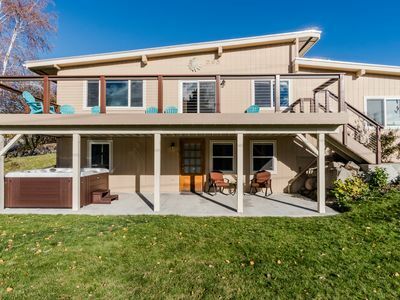 Featuring an updated bi-level interior, this home has a spacious open floor plan with living and kitchen areas, a game room up a set of stairs, an entertainment room, and four bedrooms split between both floors. 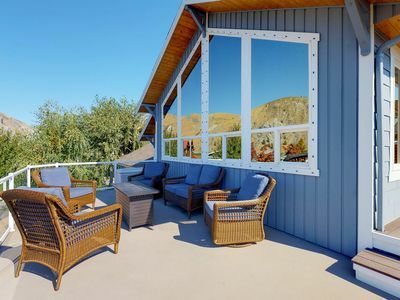 Modern conveniences include WiFi, a wood stove, cable-equipped television, stainless steel kitchen appliances, a private washer/dryer, and a gas grill on the deck. Up a set of stairs from the first floor, you'll find the game room's billiards table, large flatscreen TV, and plush seating. In the kitchen area, whip up homemade meals with all the cooking accessories you'll need, then sit down to eat with your group at the eight-seat table. 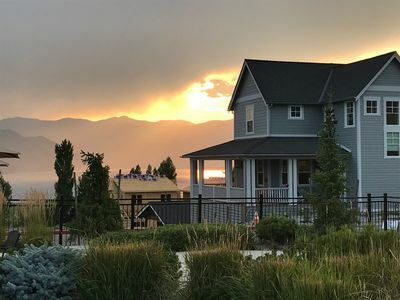 When the weather calls for it, the outdoor deck provides the perfect setting for al fresco dining with panoramic views of the lake. 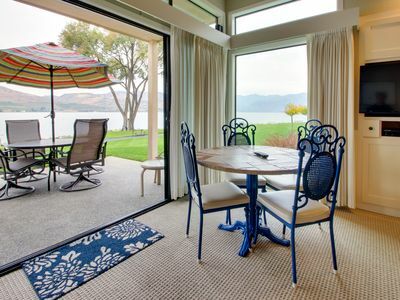 A covered back patio area offers a third option for mealtime seating. 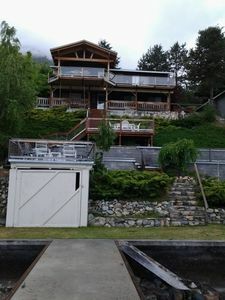 Four bedrooms accommodate up to 12 guests (please note that there is a maximum of eight adults allowed). 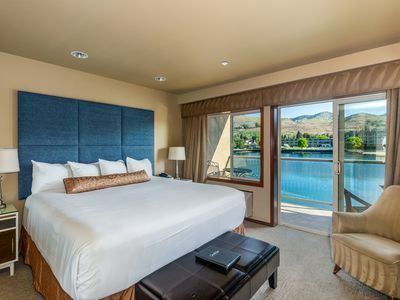 Two bedrooms sit on the main floor and have a king bed and a queen-size bed, respectively. Downstairs, you'll find the third bedroom with a king bed and a fourth with a twin-size bunk and twin trundle. A full-size futon adds space for your final two group members. There are also two full bathrooms. 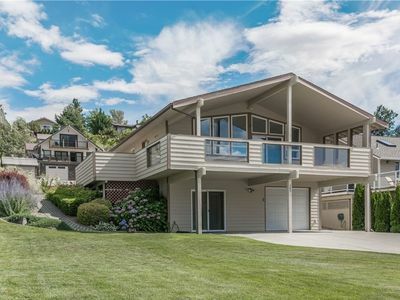 Many great day trips are just a short drive away. 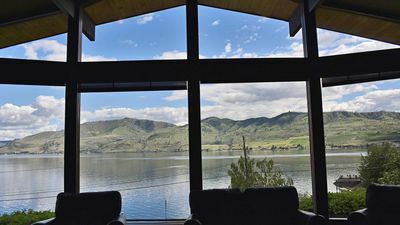 Explore the area's numerous wineries, including Wapato Point Cellars, WineGirl Wines, and several more, or lace up your boots and go for a hike in the surrounding Wenatchee National Forest. 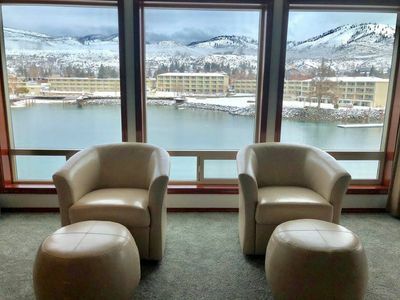 You'll also find watercraft rentals for summer fun on Lake Chelan, golf at three local courses, and seasonal events in town like the family-friendly Lake Chelan Winterfest (a must-see!). 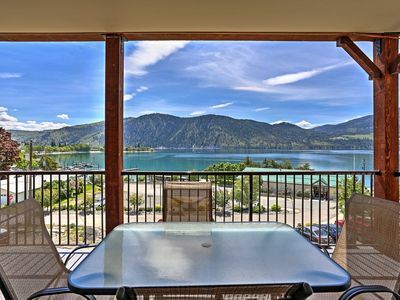 Experience lakeside living at its best from this charming vacation home. 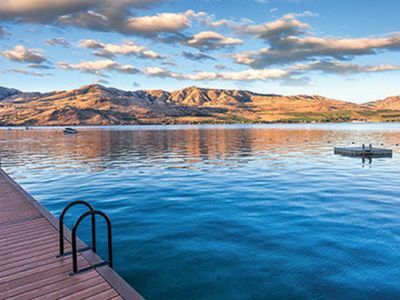 Reserve your dates today for an incredible Manson getaway! Minimum renter age is 25 years old. 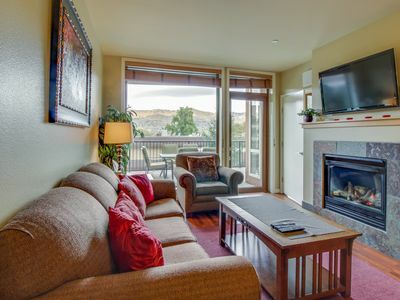 This applies to ALL GUESTS that will be occupying the unit with the exception of multigenerational families. 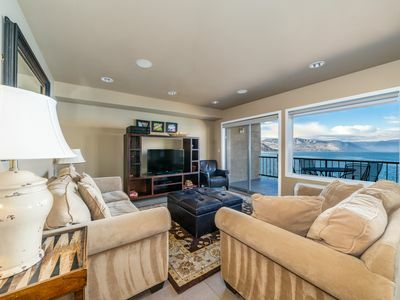 Lakefront condo with shared pools, hot tub, dock, beach access! 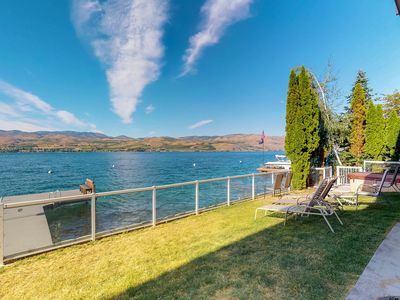 The Most Prime Spots On Lake Chelan. 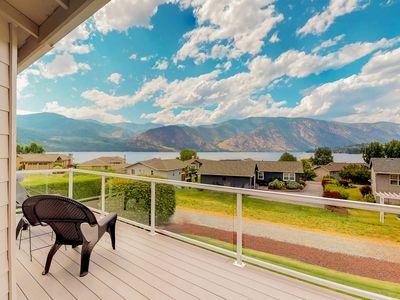 The Best Place to Enjoy The Chelan Valley! 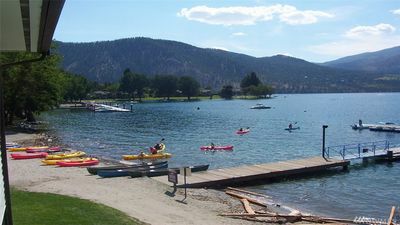 Boating, hiking, golfing, skiing and more! 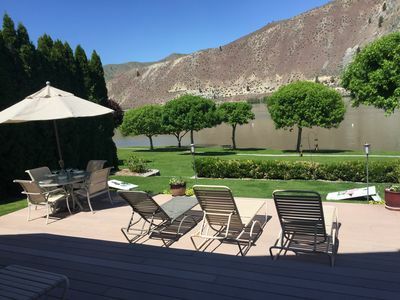 Dog-friendly home w/ river view, shared pool, boat launch, & beach!